President Emmerson Mnangagwa may be part of the audience set to watch Operation Restore 'Regasi', an 80-minute-long play that gives a comical account of the events that took place in the country last November, leading to the resignation of then president Robert Mugabe, it has emerged. The play, written and directed by National Arts Merits Awards-nominated director Charles Munganasa, premieres at Theatre in the Park in Harare on March 28 running to 30. "The president, through an individual who approached us, asked for a snippet video of this play two days ago and although we have not gotten a response, he could be joining us," Munganasa told The Standard Style on Friday. Although the Zanu-PF government has not been friendly to playwrights delving into politics in the past, the terrain appears to have changed in the "new dispensation". "This era is a bit different from the old times and listening to him (Mnangagwa) speak about being open for business, it has given us artistes more courage to showcase our artistry without fear," Munganasa said. 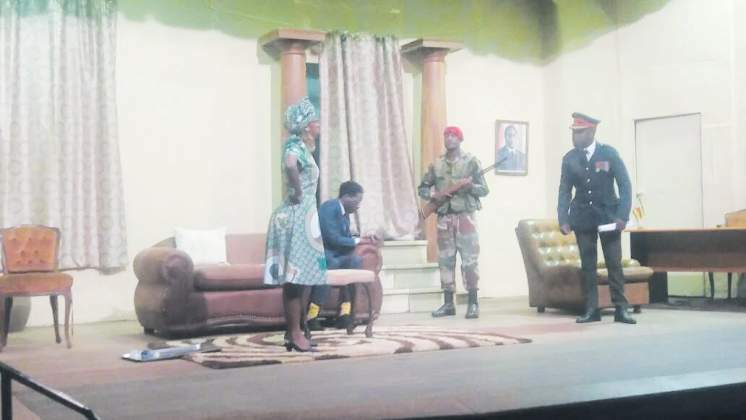 The play, which focuses particularly on events that took place at the Blue Roof mansion, Mugabe's private residence in Harare, employs an imaginary and satiric style, guided by actual events that took place during that week of immense suspense. "The idea to write this play came as a result of the need to document such historic events, which I always try to write about whenever there is something of note, so that the plays can serve as reference in future," Munganasa said. The playwright, who plays the role of former Zimbabwe Defence Forces commander General Constantino Chiwenga and has in the past written a play titled Concourse of the Rainbow Nation, giving on account of the xenophobic attacks in South Africa, said the use of sarcasm was to ease the tension of an actually grave story. "I used comedy to bring the much-needed comic relief because during the actual events, the situation was too tense, but now, the audience can revisit the period while they relax and eat popcorn," he explained. The play was earlier this month staged for the second time at the Charles Austin Theatre in Masvingo due to public demand, which saw both shows attracting full houses. "It is a very topical issue being addressed here, that is why it attracted a big audience to the extent of being requested to replay owing to the interest," Charles Austin Theatre director Michael Khethani Banda, who features as Mugabe, said. Other seasoned members of the nine-member cast include Farirai Mukumba and Carol Magenga, who plays the feisty Grace Mugabe, among others.